This is a compensated campaign in collaboration with Latina Bloggers Connect and Avocados from Mexico. All thoughts and opinions are my own. Please note: Little Mama is currently 13 months old. When starting your baby on solids, make sure to introduce one new food every 4-5 days to test for allergies. 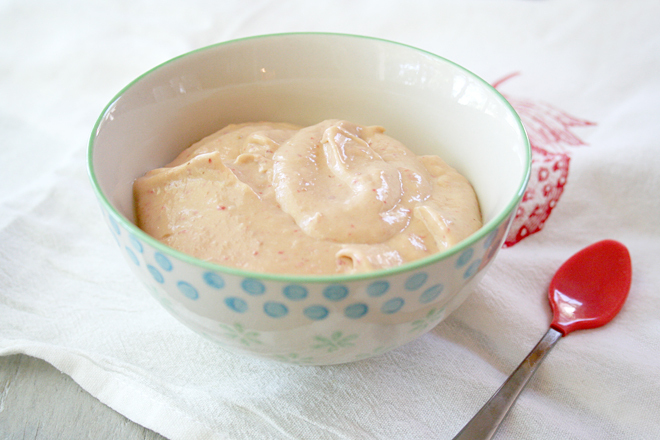 Little Mama started on solids at 10 months – her first foods being pureed avocado and mango. Once I introduced her to strawberries, I added this smoothie to her diet. Avocado’s are a staple in my home. We go through 6-7 avocado’s a week. Most of them feed Little Mama. Avocado’s are a baby’s best first food. They have been a first food for each of my children. They are rich in monounsaturated fat for a babies brain development and growth. They are filled with vitamins and minerals including potassium, magnesium, calcium, and iron. They’re a super food for baby and what’s best is that they are easy to mash to a creamy consistency making it a perfect food to take on the go. I never take jars of baby food with me on my travels. Just avocado’s and a fork. Little Brother LOVED his avocado’s when he was a baby. It was a running joke in my family that he was going to turn green from all the avocado’s I fed him. Little Mama is different. She’s more, delicada (delicate), as my mami would say. For my Little Mama, every day I blend her an avocado smoothie for lunch. Her favorite is an avocado, strawberry, and mango smoothie. Adding strawberries and mango’s gives this smoothie an additional boost of antioxidants, Vitamin C, and A. Often, I’ll also add an egg yolk from my backyard hens, and half a tablespoon of coconut oil which adds extra nutritional benefits including Vitamin D, E, Omega 3, and body nourishing properties from the coconut oil (anti-bacterial, anti-fungal, etc…). This blend ends up being a powerhouse of nutrients for a babies developing body that’s quick and easy to make. The power of real food… don’t you love it?! I buy Avocado’s from Mexico at Trader Joes. They come in a bag of 4. Since they’re on the clean 15 list, I don’t hesitate to buy them conventionally. For my smoothies, I like to buy frozen mango’s at Trader Joes as well which taste fabulous. The frozen mango’s is what makes the smoothie nice and cold. Avocado, strawberry, and mango smoothie – An easy to make nutrient dense food for baby. Add all ingredients to a blender and blend to a creamy, smooth consistency. Did your children eat avocado’s? Tell me, what’s your favorite avocado dish? My 1st 2 kids loved avocados as babies, stopped liking them and now like them again! My 3rd baby is 5.5 mo, so soon enough he will be trying them as a 1st food as well. Avacados & bananas are wonderful 1st foods for babies-super nutritious, squishy and portable! Your baby girl has the most incredible eyelashes! What a cutie pie:). Yep, I have made this smoothie for all my kids too! Remember how I used to bring a small bottle of smoothie for Naomi to church on Sundays? We love avocados and go through several a week! We get the Mexican ones and thankfully they are fairly inexpensive here. This is also great for popsicles!! I was going to start freezing them as pops, Alisha. I always save my leftover smoothie for a quick snack and that includes eggs. Hasn’t harmed me, lol! !